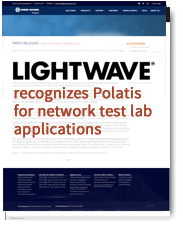 Communications providers and data center operators rely on system test labs to rigorously test new equipment and to verify network service quality, reliability, and security, before deploying in their infrastructure. 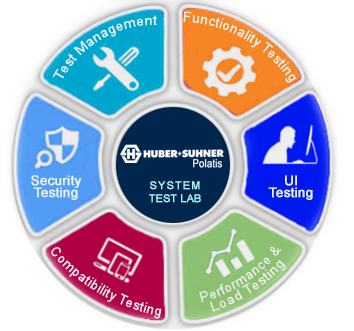 These test labs are also used to simulate customer network environments so that issues can be identified and resolved quickly without deploying technicians in the field. As networks rapidly move to higher 100+ Gbps speeds and beyond, and more connected devices and equipment are required to deliver expected services, the network test lab is becoming increasingly complex and expensive. Traditional optical-electrical Layer 2/3 devices typically used to interconnect equipment in test beds simply can no longer handle the number of connections and higher speeds needed to test configurations with a high degree of accuracy. And, having to physically switch out network interface modules, or in some cases, perform complete forklift upgrades when a different frame format or data rate is implemented, leads to slow test and verification cycles and can introduce more potential for errors. Reduced OPEX. With the ability to connect any port to any port, equipment can be cabled once and tests can be configured instantly, saving roughly 75% of cabling time. Remote testing can be conducted from anywhere in the world, so staffing and travel expenses are greatly reduced. Reduced CAPEX. 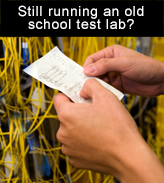 Expensive test and network equipment can be shared across multiple tests and multiple system test lab environments, decreasing repetitive equipment purchases and saving on power and scarce real estate resources. Improved Accuracy. All-optical connections are completely transparent, with no packet processing, so tests are conducted with a high degree of accuracy. Greater Test Coverage. Using integrated variable attenuation and shutter features, optical switches can stress-test system responses to physical layer faults such as connector degradation and difficult-to- trace intermittent fiber micro-breaks. Faster Customer Response.. Customer network configurations can be recreated and simulated quickly so that potential corner case issues can be identified and resolved faster. Competitive Advantage. The longer it takes to certify gear, the bigger the challenge for operators to roll out new services ahead of competitors. 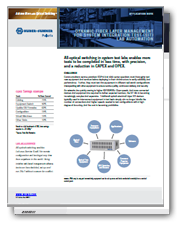 Fiber layer automation speeds up certification and facilitates deployment of more robust solutions. Future Proof. 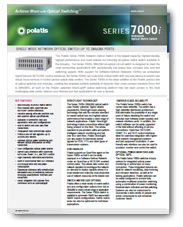 All-optical switches are transparent to transmission wavelength, direction, protocol and bit rate so the same optically-switched lab infrastructure can be used for any media and speed up to 400Gbps and beyond. Industry's lowest optical loss and superior performance, critical to ensuring the most accurate test data. Uniquely offers the broadest range of symmetric, asymmetric and single-sided matrix configurations required to meet the evolving needs of test labs. System architecture that can scale modularly to support any size network - to tens of thousands of fibers. True dark fiber switching, which requires no light to make and hold connections, is critical when testing with low power, bi-directional, or intermittent signals. Integrated Variable Optical Attenuation (VOA) enables rapid simulation of multiple link and span loss permutations. Programmable shutter feature allows introduction of intermittent and repetitive fiber breaks to test system response to unusual fault conditions. Integrated with Quali test orchestration software to replicate and schedule tests across multiple organizations and coordinate with higher layer equipment and devices. Easy to control, with support for the most popular network management interfaces including NETCONF and RESTCONF Software Defined Network (SDN) protocols.